INT. 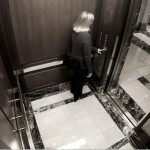 Moving Elevator - Need a battery-powered flo-style lighting solution capable of high-output, color accurate results? Dracast has a solution for you! First off, shout out to DC-Camera for getting me setup with this rental! If you're on the East Coast and looking for these lights (or basically anything), they're the rental house to go to! 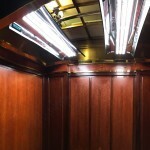 On a recent shoot with Shane Colella of Colella Digital for the Humane Society of America, I was tasked with naturalistically lighting the inside of a gritty elevator - the catch? 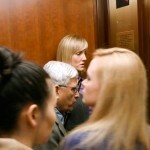 We had no access to power, the entire elevator was in the shot, and it moved between floors. Normally, this would be the perfect job for some Kino Flos, but the special set of requirements meant trying something different. 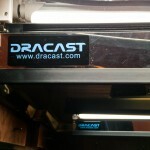 Kyle at DC-Cam suggested the brand-new Dracast T2000s, which are V-mount compatible and easily mountable. Accurate Color // One of the best part about the Dracast's is their colour neutrality. The reason I tend to stray very far away from LEDs is their lack of a complete spectrum, as well as noticeable shifts in the magenta/green balance, even when manufacturers boast high CRIs (looking at you, Westcott) - this was not an issue with the T2000s. Throughout their entire kelvin spectrum, they felt very neutral and there were no noticeable green or magenta spikes. High Output // Another amazing feature is the high output for the bi-color option! As their size is comparable to the Kino 4'x2, I've pulled the photometrics data from Kino's website and compiled it into a chart based on my own readings of the Dracasts (all data is from an L-478DR, recently factory calibrated). At 3200˚K, the T2000s are about a stop under the 4'x2, but they actually match it very well at 4650˚K (the brightest option on the light). Lightweight // As we were mounting the lights to a section of roof-mounted 5' Speedrail, it helped that the fully-kitted lights each weigh under 10lbs. This kept everything safe, stable, and secure, even whilst moving between floors. Power // At 110w, the low power draw of the Dracasts is impressive to say the least. Much like their output, its comparable to the 150w power draw of Kino 4'x2. On this particular shoot, the 100-minute, full-intensity runtime off our V-mount batteries certainly made shooting a piece of cake (and we ran no issues, even though we only had access to four dedicated V-mounts batteries). 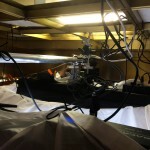 DMX // As of writing, there are no solutions for a DMX-controlled 4'x2 fixture. Kino has recently rolled out their 4'x4 Tegra, but not only does it weigh almost 20lbs, they're also difficult to source locally. On this particular shoot, DMX wasn't a factor but the standard RJ45 jacks on the back make it a breeze. Bi-Color // As with most bi-color lights, they do suffer from variations in output as color temperature adjusts. 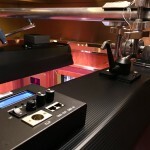 In the 3200˚K to 5600˚K dimming range, the lights peak around 4650˚K. Since we needed the extra output, I opted to shoot at 4600˚K. Punch // Personally, I feel that they're very punchy. 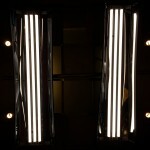 In quality, they feel closer to Diva lights or Barflys than large banks. On the Humane Society Shoot, I tented both lights with a 6x6' full grid, giving me two pockets of controllable soft light. Lack of Safety Cable Loop // Whilst a very specific flaw that was easily solved, the lack of a safety cable loop bewilders me. Inclusion of this loop has become standard on almost all panel and flo-style lights, as they're often rigged overhead and its an extra level of protection to keep sets safe safe should something fail. The new T2000 lights from Dracast saved my bacon on the Humane Society shoot and were the perfect tool to accomplish the job! Its great to know that I can happily add them to my quiver of solid lighting solutions should I ever again have the need for a battery-powered flo light. If you'd like to check out some screen grabs from the recent shoot, click the images below!